You may believe it or not but there is a place where I could go back every month and would not get tired of it. And it’s not a hot Mexican sandy beach or the Canary Islands. It’s Barcelona. I wouldn’t be one hundred percent guiri if I wasn’t in love in Barcelona – definitely one of my favorite cities in Spain. It is not only because of the great Sagrada Familia, Park Güell or pan tumaca, however the latter has been adapted as my everyday breakfast ever since I was in Barcelona for the first time. For me, Barcelona is the most mysterious and fictional place, filled with secrets, with incredible stories screaming out from every Catalan modern edifice. It all began with the first novel I read in Spanish The shadow of the wind by Carlos Luiz Zafon (it’s first part of Cemetery of the forgotten books series) and I loved it so much! It’s a history of a half orphan boy who works with his father in a small bookstore in nineteenth century Barcelona, which by the way seems like the most incredibly amazing city in Europe. His life becomes full of secrets and mysterious incidents ever since he finds an old book by Julián Carax in the Cementer of the Forgotten Books. Comparing Barcelona by Carlos Zafon with present-day, it looks like not much has changed. The city still has its unbelievable charm, breath-taking buildings by Antonio Gaudi (and not only), the lovely harbor, the great La Rambla…I could go on and on! The thing is that every time you visit Barcelona you’ll find a new amazing place you hadn’t seen before. I couldn’t love it anymore! The last time I was in Barcelona I visited Casa Batlló. I can’t explain why I hadn’t visited it years ago, which I definitely should have done. To be honest, I had never seen the building at close range and maybe I just had thought that another of Gaudi’s building would be too much. And I was so wrong! I have seen a lot of Gaudi’s work pieces all over Barcelona and Spain – the El Capricho in Comillas, Casa Botines in Leon, Casa Miló, La Pedriza…but with none of them did I get hypnotized as I did with Casa Batlló. 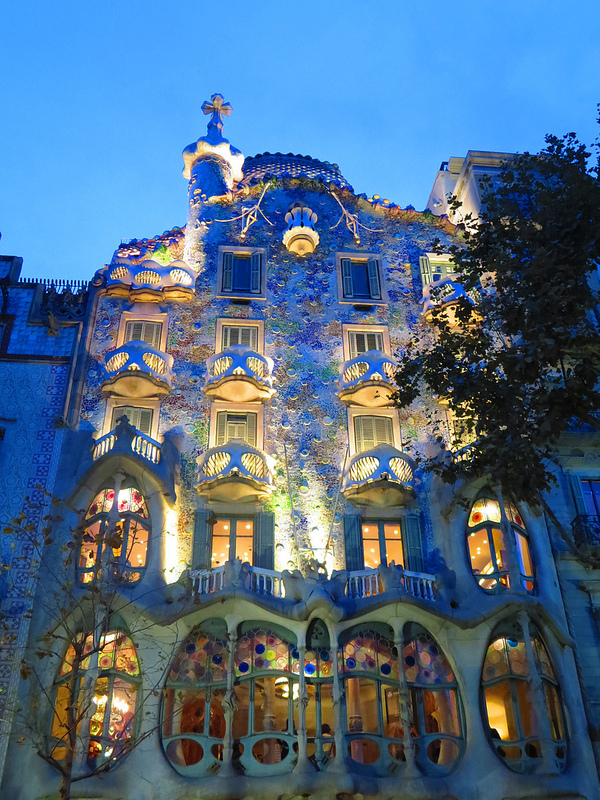 The building is situated on Paseo de Gracia in Barcelona’s downtown. You don’t need to know the number, you’ll spot it by its dragon’s shiny back design on the roof. It’s deep blue grey during a cloudy day and yellow blue during a sunny day. When the sun goes down it becomes marine light blue with a red glow. Once you find it, you’ll probably doubt whether or not to pay 21 euros to get in. It seems a lot but based on my personal experiences, it’s totally worth it. Even if you’re not an architecture enthusiast, you’ll still enjoy the tour. 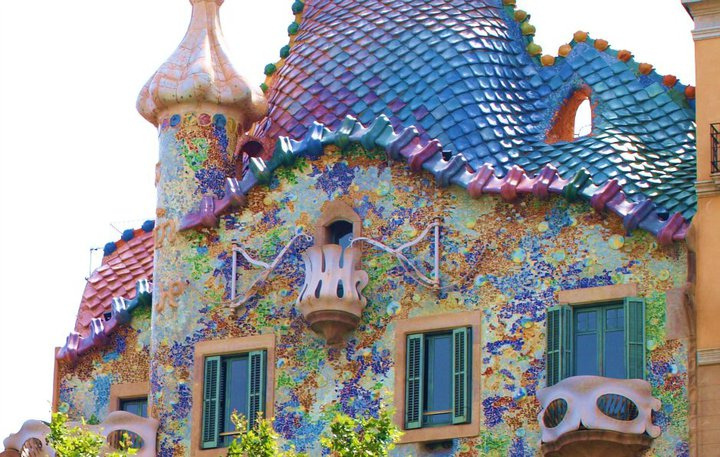 Antonio Gaudi was hired in 1904 to design the reconstruction of the house. It took him 2 years to convert a mediocre middle class building into one of the most emblematic buildings in Barcelona. The edifice has 8 floors, a dragony roof and an external courtyard. 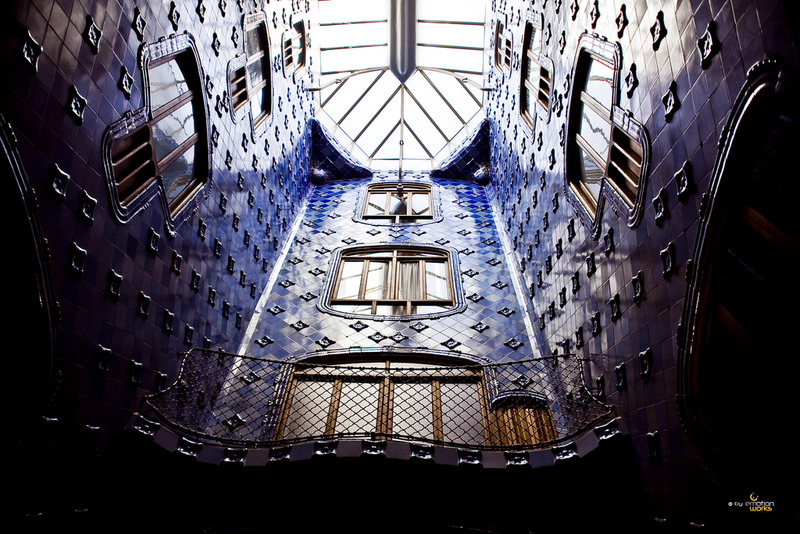 The noble floor was used by the Batlló family and the rest of the floors contained apartments for rent. 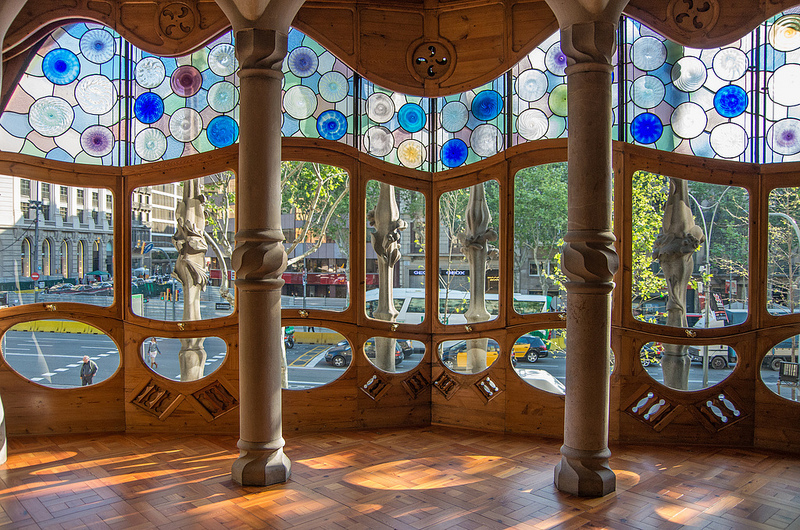 The noble floor’s curved windows are spread over the whole wall, opening a great view to Paseo de Gracia. Not only could the Batlló family see the city’s life, but also passer-bys could admire the unbelievable internal animal-like décor with Mediterranean influence and mushroom-shaped fireplace. 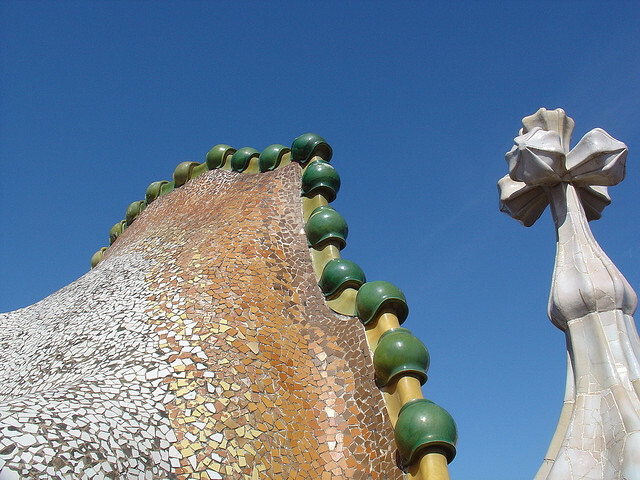 That was really thoughtful of Gaudi – let the poor mediocre mob sneak into my great piece of art! Who the hell were the Batlló, you may ask? One of the richest and most important textile industrialists on the Catalan coast. The great thing about the edifice is that with every next floor you’ll find it more amazing and unbelievable genius. Once you start going up the stairs (massive, wooden and curved) you realize that the eight-floor corridor is actually something more. The walls are made in all shades of blue and green colors, shinning in the borders. If you look up, it feels like you are underwater, diving in the crystal clear Mediterranean sea. Don’t stay there too long if you get motion sickness easily, it actually feels as if the walls were floating. The top floor was originally dedicated to service and laundry rooms. I really wouldn’t mind working there, even as laundress. The whole floor’s walls are curved with tiny windows and really unusual lightings, which makes the site cozy and homey. Even the bathrooms and their bathtub, sink and wardrobes are gorgeously designed. I wonder how it would feel to pee there! Once you’re up on the roof you can finally see the dragon’s skin at close range. I recommend going there when it’s getting dark so you can admire the lighting. Actually I am not able to tell you for sure what color it was. No, I am not color-blind, it was just so colorful and intense that I was kind of color-thrilled. The dragon overlooks Paseo de Gracias so you can check out the view of Barcelona’s downtown by night. To go down you should take a ride on the elevator which is the original one. It feels like being in a time machine actually. It’s pretty old and slow but don’t worry it works just fine. If you are not convinced to visit Casa Batlló, you can still check out the main facade from outside. The first floor facade’s gallery is made of Montjuïc sandstone, the rest of the floors are made of colorful pieces of ceramics with protruding balconies. Be sure to check it out by night as the building is lit and you can see each of the multicolor tiny pieces shining out and melting with the dragon’s skin on the roof. There are 2 benches in front of the building which are just perfect for free-admiring. Just get dibs on the spot and wait for the show.